We're thrilled to release another TEAM Dr. Dish Skill Builder workout that focuses on shooting, ball handling, and plyometric drills! At Dr. Dish Basketball, we're always working in the Dish Lab to bring you applicable drills and workouts to incorporate into your practices/workouts. And with the season just beginning, we wanted to showcase a few different ways to use Dr. Dish during the season. 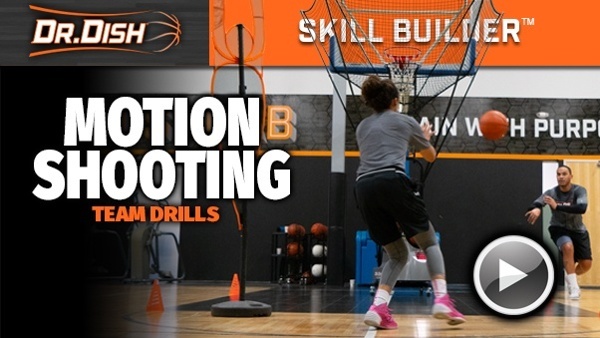 It's a common misconception that shooting machines should only be used in the off-season. In actuality, it's a great idea to incorporate Dr. Dish workouts within practice or before/after to maximize shooting reps and work on multiple skills. With Dr. Dish Skill Builder technology, you're no longer limited to just plain shooting drills. While we love building better shooters we're even more interested in building COMPLETE players.